Delirium In The ICU May Pose Ongoing Risk Of Thinking Problems : Shots - Health News Doctors and nurses are starting to look more carefully at delirium as a health problem for people who have been hospitalized. It may signal long term thinking problems, a study says. More emphasis is being put on preventing delirium in hospital patients by getting them walking sooner and encouraging adequate sleep. 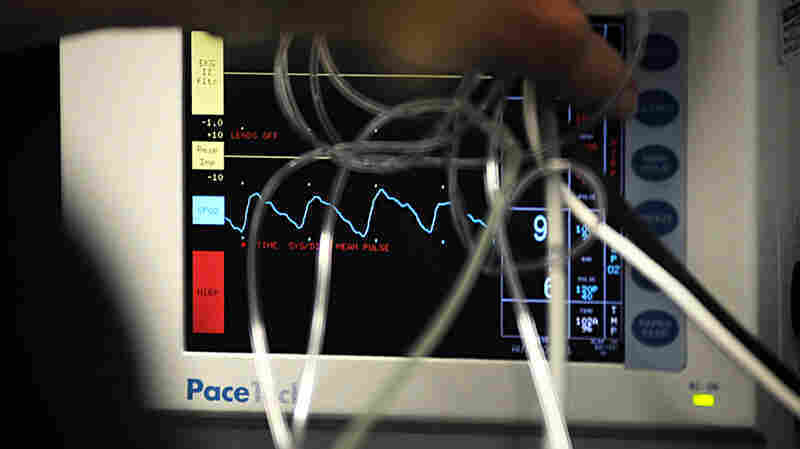 Hospital intensive care units save lives, but people there often suffer from delirium. People admitted to a hospital's intensive care unit often suffer from delirium. Many of those people end up with thinking problems months after they leave the hospital, a study finds. Nearly three quarters of the 821 ICU patients the researchers tracked suffered from delirium, which can include confusion, agitation and short-term memory loss. That's not unusual, especially for very sick people like those in this study, most of whom were on ventilators. But only recently have doctors realized that people with delirium in the hospital are apt to have thinking problems that can persist long after they leave the hospital. To get a better handle on that, the researchers tested the cognitive skills of former ICU patients. Three months after their stay, 40 percent of the patients who could be reached for followup testing had thinking problems similar to people with traumatic brain injury, and another 26 percent had thinking problems similar to people with mild Alzheimer's disease. At a 12-month follow-up test, fewer people were available for testing. The percentage of people with cognitive problems declined slightly, by 6 percent for those who had problems similar to traumatic brain injury and two percent for people with problems similar to mild Alzheimer's disease. "Some patients have persistent cognitive impairment; some have improved; and there are others who have not had impairments at three months and first start showing impairments at 12 months," says Dr. Pratik Pandharipende, an an associate professor of anesthesiology and critical care at Vanderbilt University Medical Center and the lead author of the study. Lots of things can cause delirium, including medications, surgery, infections and lack of sleep. But age didn't seem to be a factor when it came to long term effects. The patients' median age was 61, and patients 49 or younger didn't do much better than the older ones when it came to avoiding cognitive impairment. People who suffered from delirium for five days or more had worse scores on their cognitive exams than did people who had delirium for less than five days. The tests measure memory and the cognitive skills needed to do things like balance a checkbook. The study was observational, so it didn't have a control group of people with no delirium. Instead, it looked at cognitive impairments based on how long people had delirium. The researchers also looked at whether sedatives and other medications were a risk factor, but didn't find that to be true overall. People who took sedative benzodiazepines did worse on executive function tests at three months, but not at 12 months. Doctors and nurses are starting to realize what a serious health issue hospital-based delirium is, Carol Thompson, an acute care nurse practitioner and president of the Society for Critical Care Medicine, told Shots. "We were only familiar with the very hyperactive kind of behavior." Thompson says. "We weren't aware, frankly, of delirium that can be very silent. And only 5 percent of delirium is in its hyperactive phase." As a result, hospitals are starting to focus on preventing and treating delirium. Two simple actions seem to help: getting patients walking, and making sure they get some sleep. "We have a lot of research now that shows that patients who are awake and mobile have less delirium," Thompson says. "And so getting folks up and moving is something we're doing more in the ICU now than we ever have before." Patients who can't be mobile can benefit from being asked to think about simple questions like whether they're wearing glasses or what day it is, Thompson says. The study authors plan to follow up with their participants to see if their thinking improves with more time. Pandharipende told Shots that he hopes that when people come out of the ICU complaining about memory loss, it's not brushed off. "We all need to be aware of it," he says. "And perhaps in the future we will start thinking about cognitive rehab just like we do physical rehab."